Dr. Logan is a renowned ophthalmologist and eye surgeon in Orange County, whose practice consists of refractive and anterior segment surgery. He has a keen interest in complicated cataract, glaucoma and oculoplastic surgery. He maintains a progressive and innovative practice in ocular surgical techniques and procedures including: corneal transplants, cataract surgery, phakic intraocular lenses, LASIK and refractive lens exchange. Dr. Logan utilizes advanced techniques for treatment of myopia (nearsightedness), hyperopia (farsightedness), astigmatism and presybyopia (loss of reading vision in patients over 40 years of age) in Laguna Hills and his other Atlantis Eyecare offices. 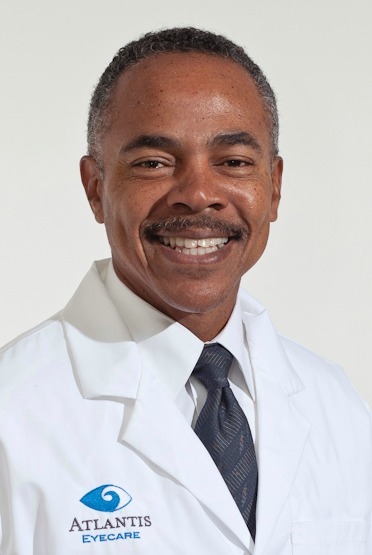 As a top eye surgeon and ophthalmologist in Orange County, Dr. Logan has been practicing for over two decades, performing tens of thousands of microsurgical and ophthalmic laser procedures to patients in Laguna Hills, Newport Beach and surrounding areas. He has been recognized by the medical community for his exceptional surgical skills and for being in the forefront with new microsurgical technology. In addition, he has published several studies and is a national speaker on the topic of cataract and advanced technology intraocular lens implants. Dr. Logan is the founder and medical director of Atlantis Eyecare in Orange County. He has built Atlantis Eyecare to one of the largest eye care practices in the nation. He attended Medical School at UCLA/Drew Medical School. He went on to complete a unique ophthalmology transitional internship at Los Angeles County USC Medical Center and did his Residency at Howard University Hospital. Laguna Hills eye surgeon Dr. Logan is board certified by the American Board of Ophthalmology. He is a fellow and member of the American Academy of Ophthalmology, American Society of Refractive and Cataract Surgery and Association for Research in Vision and Ophthalmology. Dr. Logan operates out of a number of our offices in Orange County and Laguna Hills and welcomes the opportunity to assist in optimizing your life style by improving your eyesight with eye surgery or other eye treatment methods. As a top ophthalmologist in Laguna Hills and Orange County, Dr. Logan utilizes his knowledge and experience to perform effective eye surgery and help you live a better life because of it. I was in and out in no time, the whole procedure was over so quickly! I received excellent care at Atlantis. Everyone answered questions I had and gave great service. Very pleased with the attention and thoroughness of Dr. Logan and am looking forward to surgery with him. Dr.Logan is a wonderful doctor who treats patients with empathy and skill. He is forthright and honest with the diagnosis. His staff use warm, friendly and welcoming. I was seen within a couple of minutes of my appointment time, which is great!! All staff were friendly, competent and efficient. Dr. Logan explained everything fully and answered all of my questions. What more could anyone ask of a physician's office?? Excellent. Staff is always friendly and caring. Dr. Logan is very attentive and spends time answering patient's questions. Dr. Logan performed cataract surgery with a new lens. And I am very happy with the outcome! Thank you Dr. Logan, I appreciate your talents very much. I am the happiest I have ever been, because I know I will never have to wear glasses again. I am writing this letter to say a big thank you to you and your staff (without glasses). I cannot express the joy I feel now, I can read medicine bottles, street signs, books and my computer all without glasses. I feel younger and my husband loves the way I look now. I feel less vulnerable too. You and your staff treated me above and beyond my expectations. They held my hand through their knowledge and smooth functioning at a new experience, everything was written and explained well. The nurses at the surgery center were also very kind giving me warm blankets before surgery as I was cold. Thank you again for the life changing experience to you and your staff. When my Mother was being seen at Atlantis Eyecare for her severe glaucoma, I decided to have Dr. Dwayne Logan as my eyecare specialist. During my yearly eye exam, I saw the pamphlet regarding multi-focal implants. During the exam, I asked Dr. Logan if I would be a candidate for such surgery. Seeing that I had a cataract that needed surgery, I was indeed such a person. Each eye was implanted in two individual surgeries. The procedure was totally painless and I had perfect vision almost immediately. Everything was brighter and clear as a bell, and it only got better after that. Dr. Logan and his office staff were very helpful getting the right pre-surgical tests done expediciously. I have never been happier with the results I've experienced with his great surgical knowledge of the eye. My mother and myself both loved his practice and his sense of humor. We as a family have known him for nearly 20 years, and would only trust him for our most precious sense, our eyesight. I am very satisfied and happy I can see with my new premium eye. Dr. Logan is a great doctor and has much patience. Amazing surgical skills! I had a work related accident where I almost lost my entire upper eyelid. The dr explained all procedure elements before I underwent surgery and was deeply confident in his ability to make me look like new...he was not wrong. My eye and eyeball healed extremely fast and my scar is minimal. The dr's skills is unmatched! My eyelid was split vertically and horizontally. The vertical scar is gone and the horizontal scar is hidden in my eyelids natural crease. I am both humbled and amazed at the dr's skill, personality and dedication to his practice. Thank you so much. Thank you so much for all you have done in helping me to see clearly again. It is such a pleasure to be able to see without using contacts or glasses. I not only appreciate Dr. Logan and Dr. Walcott’s professional skill, but I am grateful to the office and nursing staff, and Glady’s in particular, for putting me at ease and preparing me for the procedure. Thanks again for the gift of vision. Dr Logan, I want to thank you & all the staff that supported me before, during and after my cataract surgery. I never imagined the results of surgery would be so successful and so soon after surgery! My eyes feel like teenagers' all over again! I want to express my thanks to you and Atlantis Eyecare for the successful cataract surgery and the implants of the Multifocal IOL lens. I am convinced that I made the right decision because my vision was deteriorating and I was afraid to drive at night. I am no longer afraid to drive at night. Permission is granted to use our testimonial on print and internet media. We have had the pleasure of meeting Dr. Logan and the team of Atlantis EyeCare for the past few months. Our son was born with cataracts in both eyes which we found was from family history and when it appeared his eyes were not going to improve in vision; our family doctor referred us to Atlantis EyeCare. Dr. Logan’s office is very kid-friendly; Staff is wonderful-kind, concerned, and easy to work with. Dr. Logan is not only personable, but a leading expert in the field of pediatric ophthalmology and a cool guy (if memory serves, his children just went off to college!). Our son had been bounced around from one doctor to another prior to knowing Dr. Logan because we were not comfortable with the doctors we were referred to in the past, who not only were unfriendly but quite frankly didn’t know how to handle a young child as our son (he is 7 years old). Our first visit occurred a few months ago; Dr. Logan and his team, Lucy and Nicole did a thorough exam, and advised that our son was at a critical stage of his vision and if the cataracts were not removed he would have to wear very thick glasses as his vision would degrade. Surgery was recommended immediately. Believe me; there is nothing scarier than watching your child being wheeled away to surgery and knowing someone is operating on his eyes...but knowing that someone was Dr. Logan and Atlantis EyeCare made it easier. Our son’s eyes are now progressively getting better and he is very excited. His constant squinting that he had before the surgery that would make it hard for him to do homework and interact with other kids at school is now gone and his vision in my opinion has improved immensely thanks to Dr. Logan and the team at Atlantis EyeCare. Of course being a parent, I needed to check out Dr. Logan and Atlantis EyeCare and found nothing but admirable content online and many happy clients; none have had anything negative to say. They were all overwhelmingly positive; including some parents who were so pleased with their kids' results that they were planning surgery themselves, that would count my wife and soon me with Dr. Logan and the team at Atlantis EyeCare. I highly, highly recommend him should your child need an ophthalmologist. P.s. Now that my son has greater vision, his homework habits have improved and now I am the one with the visual handicap since now it seems he’s always beating me at video games that we play together. Unfair advantage! Great & Kind Doctor. My husband & I really like Dr. Logan & will return to the office again. I had glaucoma surgery on Wednesday 1/23 at Talbert surgical center in Huntington Beach with Dr. Logan. Everyone who saw me at the surgery center (and there were many) were very kind, attentive, and very pleasant to deal with. They put me at ease immediately and took care of my every need. I was extremely pleased wth how they treated me and how quickly I was in and out of there that day. Doctor Logan was exceptional, he opened my eyes to new possibilities. Dr. Logan and staff are very nice, understanding and they are the best!!! I was impressed that Dr. Logan was willing to come in on a Saturday to take care of my eye which needed an additional stitch.